We sell electric radiators in a range of sizes, with models to suit rooms both large and small. Radiators with a higher wattage have a greater heat output and may be needed to achieve comfort temperatures in larger rooms. 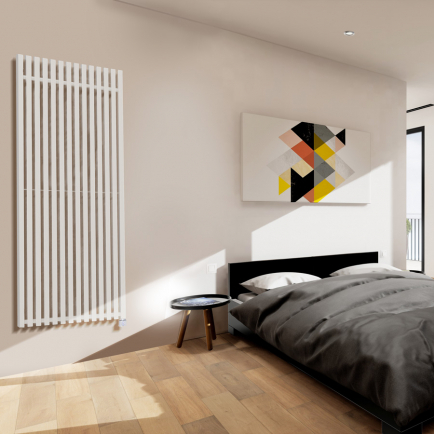 Each of our radiator ranges includes radiators with higher and lower wattages: these radiators typically look identical but are longer, wider, or have more heating panels. However, all the radiators in each range will have the same depth – in almost all cases, a radiator of 1700w will be just as slim as a 450w radiator in the same range. You can calculate the total wattage required to heat your room using our interactive radiator calculator. The calculator will work out your required wattage based on the dimensions of the room and the type of property you live in. You will then need to find a radiator, or combination of radiators, that adds up to the required wattage. Do not be tempted to choose smaller radiators than recommended – even in those rooms where space is at a premium. Under-specifying your heating may mean you cannot heat your rooms to the required temperatures. It will also mean that your radiators have to work harder and less efficiently, inflating your running costs unnecessarily. What is your slimmest electric radiator? Our slimmest electric radiators are the Haverland SmartWave and the Haverland RC Wave, which both have an ultra slim depth of 7.5cm. If you're looking for a slimline solution for a narrow wall, we also have a superb range of vertical electric radiators and towel rails which will provide effective warmth without taking up too much space. Our Terma Easy ONE towel rail has a trim 200mm width, whilst our narrowest electric radiator is the Terma V E Ribbon at just 290mm wide. What size conservatory radiator do I need? For the majority of rooms in your home, our wattage calculator can work out the number of electric radiators you need based on the room’s size, layout, and level of insulation. Conservatory radiators, however, have specific criteria and operate at a higher level than conventional heating to compensate for the heat loss inside a conservatory. As such, the number of conservatory radiators you require will depend on the insulation, total surface area of the glass, and the level of glazing. Because of this, we’d recommend talking to one of our friendly sales team before purchasing a conservatory radiator so they can provide you with further assistance. Why are your electric radiators so slim? Our slimmest electric radiators use lightweight aluminium elements to heat up the air and the surface of the radiator. These aluminium elements are very slim and fully integrated into the radiator frame, allowing the manufacturers to create ultra-slim radiator designs. Electric radiators are much slimmer than old fashioned storage heaters because storage heaters use heavy bricks to store and distribute heat. The narrowest heaters in our range are our vertical electric radiators, which are designed to fit onto restrictive wall spaces. By using a tall, lean frame, they're able to free up wall space so you've got more room for furniture and fittings. These designer electric radiators are also excellent as statement heaters and offer the two-in-one benefit of striking looks and space-saving heating. How heavy are your electric radiators? Our most lightweight slimline electric radiators are those which use solid state aluminium elements, such as the Haverland RC Wave and the Haverland Smart Wave. 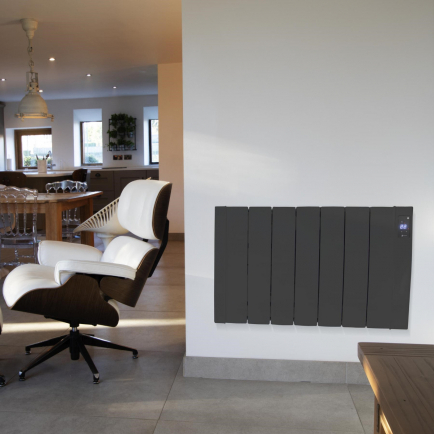 A 450w RC Wave electric radiator weighs no more than 5kg – perfect for mounting on stud or partition walls. Electric radiators which use thermal fluid heating elements are slightly heavier. The Haverland Designer TT uses a specially formulated thermodynamic gel to spread heat evenly across the radiator surface. The smallest Designer TT is a 500w model which weighs 11kg. To find out the weight of your chosen designer electric radiator, check the specifications on individual product pages. For energy saving heating that doesn’t eat up space in your home, look no further than our slimline electric radiators – stylish products with an unobtrusive fitting. With ultra slim models from as little as 7.5cm deep, our designer electric radiators offer a practical heating solution for even the most confined spaces. Take your pick from an array of traditional and contemporary designs, with sophisticated programming and highly accurate digital thermostats. Looking for a heater for a particularly narrow stretch of wall? Browse our slim and slender vertical electric radiators that are perfect for rooms with reduced space.